Harbour View - His Excellency Governor Eugene B. Holiday paid a two-day official visit to Barbados during which he met various officials on April 3nd and 4th, 2014. The visit focused on bilateral and regional relations. Governor Holiday was received by the Governor-General of Barbados, His Excellency Sir Elliot Belgrave, for a meeting at “Government House” the official residence and office of the Governor-General in Bridgetown. 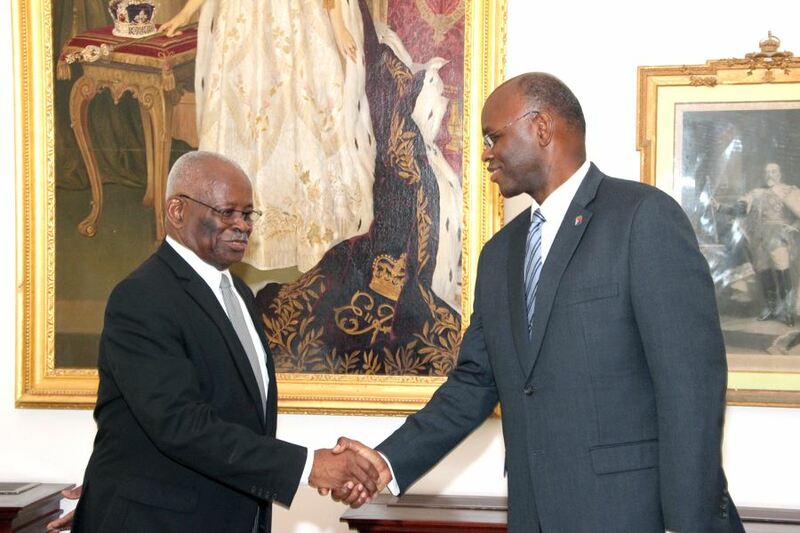 The audience with the Governor-General of Barbados was the first meeting between the two officials. Following the audience, Governor Holiday met with and attended a lunch hosted by Barbados’ Minister of Foreign Affairs and Foreign Trade, the Honorable Mrs. Maxine McClean, and discussed matters of mutual interest for Barbados and Sint Maarten, such as the application of Sint Maarten for associate membership of CARICOM. He also held talks with the Minister of Education, Science, Technology and Innovation, the Honorable Ronald Jones, and with the Minister of Culture, Sports and Youth, the Honorable Stephen Lashley. Governor Holiday’s discussions with the members of the Barbados’ government centered on topics as Caribbean relations, developments in education, opportunities for sustainable development, experiences with disaster management, stimulating the culture industry and other important governance issues. Besides his meetings with Barbadian Ministers Governor Holiday visited a number of Barbados institutions. He visited the Barbados Museum and Historical Society, where Director Allissandra Cummins and her staff gave a presentation regarding the activities of the museum in heritage preservation, followed by a tour of the UNESCO heritage site of Barbados, the Bridgetown Garrison. He furthermore, met with the Governor of the Central Bank of Barbados, Dr. Delisle Worrel, at his official residence “the Newlands” and exchanged views regarding, among others, economic developments, public management and monetary policy. Governor Holiday also met with the Public Service Commission (PSC), an independent non-political body responsible for the appointment of civil servants in Barbados. Governor Holiday was informed about the system of civil service appointments via the PSC and compared it with the process of appointments in Sint Maarten. Exploring developments in regional relations Governor Holiday met with officials of regional organizations located in Barbados. He visited the Caribbean Disaster Emergency Management Agency (CDEMA) and was briefed by Director Resource Management and Administration Division, Dr. Elvis Nurse and staff about the Comprehensive Disaster Management approach of this regional intergovernmental agency for disaster management in the framework of CARICOM. Governor Holiday provided some background on Sint Maarten experiences with disaster management and emphasized the importance of integrating disaster management into the sustainable development agenda of our countries. Stressing the importance of regional cooperation Governor Holiday also paid a visit to the University of the West Indies at Cave Hill Campus, where he was hosted by and discussed the universities vision and programs with the Deputy Principal, Prof. Eudine Barriteau. There he was greeted by various students and had a talk with two students from Sint Maarten. That was followed by a lively and stimulating session with the academic staff of the Department of Economics regarding policy challenges in the region. During his visit the Governor was accompanied by Her Excellency the Ambassador of the Kingdom of the Netherlands to Barbados, Mrs. Lucita Moenir Alam.